I like clutter. I am intimidated by super-neat, less-is-more spaces and clean lines: they seem impersonal, frosty, unwelcoming. Everything in place. I feel I’m walking on eggshells, scared I may mess up something. God help me if I do; keep imagining an OCD wave of a real-life version of Monica Geller (from Friends, remember?) being unleashed. So maybe the real-life Monica may turn out to be a sport after all — but, too late, I’m already on the backfoot. Don’t get me wrong. I don’t like dirt and grime — I’d clean those out immediately (hopefully without being obsessive compulsive). But clutter is a different ballgame. There’s warmth in it. A certain familiarity in seemingly-useless, out-of-style objects (many, many of them) that make them precious… like an extension of myself. Instead of chucking them out, I hold on to them — yes, adding to the clutter. If I’m going to a formal event or a fine-dining restaurant, then obviously I expect everything to be in place. They better be meticulously de-cluttered with only what they stand for shining through. They’re supposed to be that way. But in the domains I inhabit for “regular” living, I’d rather go with the flow, not a tutorial. Marie Kondo’s Netflix series Tidying Up With Marie Kondo is being beamed worldwide, and while there are many who have expressed discomfiture at the prospect of “neat and minimalistic” as a permanent fixture, there are reports coming in of charity donations spiking as people are junking stuff they don’t need in an effort to downsize possessions. 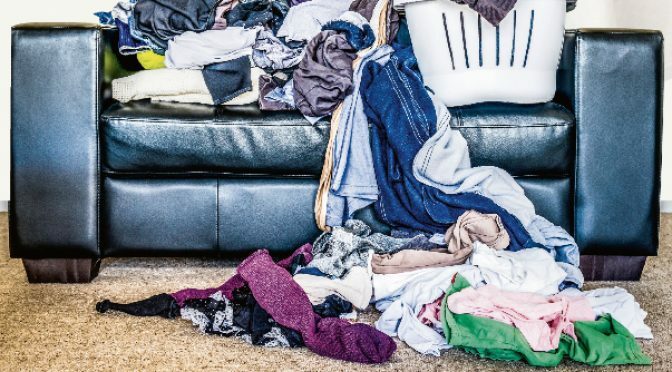 Kondo kickstarted the tidy revolution back in 2011, when her global bestseller The Life-Changing Magic Of Tidying Up became a touchstone for interiors: de-clutter, de-clutter, de-clutter — the procedural KonMari way. Two cups instead of a set. A handful of books instead of a library. Clothes folded in space-saving ways — and the fewer, the better, absolutely no safety in numbers. Identify the things that make you happy, states the KonMari way, and keep them. Throw out the rest. I like clutter in my wardrobe because it amazes me. Confounds me even. But there’s usually joy; I love it when I find Dh100 notes tucked away in swathes of cotton or chance upon a dress that I’d forgotten I’d bought (it may be two seasons old — but, really, who cares?). There should be a bunch of books scattered here and there — that’s what makes a home. A pile of ageing vegetables dumped haphazardly in the fridge reminds me I’m not cooking as much I’d like to. A jar of condiments well past their expiry date gives me the chance to wonder at the passage of time. I happily introduced more clutter into my living room by accepting an old chair — that doesn’t quite fit in with the rest of the furniture — from friends moving out of town because it reminds me of them each time I enter the space. And it breaks my heart a little when I give away DVDs of bad movies I’ve sworn I’ll never watch again; the good ones I’ll always keep even if I’ve watched them 200 times over and are (virtually) available on Netflix or Amazon Prime. My paternal grandmother — who I loved the most when I was growing up — loved clutter. Her life was a happy clutter, even though my grandfather would complain mercilessly about her tendency for “hoarding meaningless rubbish”. She never had a problem when I’d yank open her cupboards and find treasure troves carelessly tossed in them: old photos from her college days, (empty) pots of a horse-ensigned ‘vanishing’ cream from the 1950s (those days, a day cream was known as vanishing cream — and I would never have picked up that piece of nugget if she hadn’t been such a believer in clutter), a vanity box that she received when she went to watch My Fair Lady at Metro cinema… and I’d never get lectures from her about “tidying up” my own room, unlike my maternal grandmom who was a stickler for minimalist alignments in life. Clutter also gives me the chance to feel triumphant when I reorganise spots of messiness on weekends. I watch clutter grow through the week, and then I resize it to make it fit in with my expectations: it’s like having a conversation with myself — a sort of a ritual, where there’s always room for surprise. So, sorry Marie Kondo, I like clutter. It gives me the chance to rise above it. Occasionally. Previous PostAt his rally in Dubai, I got a sense of Rahul Gandhi 2.0Next PostWhy are some men on edge over a sharp, sensible ad?